The two things that get the most attention for any bride are her wedding dress and the wedding jewellery. Her bridal jewellery becomes the talk of the night for the majority of the ladies in the banquet hall. Thus brides give special attention while selecting the bridal sets for their wedding. You, as a South Indian bride-to-be, should take a glance at the wedding collections given below. They are complete bridal jewellery sets that you may have for your muhurtam and wedding reception party. In every set, you will find one common design pattern. Here it is the half-moon pattern that is being incorporated in almost all the jewellery items. The bangles and bracelets come in their unique designs. This is a set of American diamonds and pink colour zircon stones. This set is giving you more options. You can combine them for both your muhurtam and reception looks. With one choker, a pendant with chain, and a long necklace you are getting multiple beautiful options. Even the Kamar bandh (waist accessory) is strikingly beautiful. This pear-shaped pendant set looks too exquisite. With matching maangtika, bajubandh, kamarbandh and billais, this is something worth having for the wedding purpose. Multiple options have been given for bangles and kadas. Many brides try to avoid the heavy bridal jewellery. They look for light weighted exclusive bridal collections which not only look great but also easy to carry for a long time. The above set fits best for such brides. This set comes with an extremely intricate design for its each and every piece, whether the pendant, chocker, long necklace, kamarbandh, earings, kadas or the jada billai. This is a brilliant exquisite bridal set for any bride. Jewellery Artist Quote: The bridal collections, similar to the one above, are more popular with the NRI South Indian brides. They come up with a stand apart statement for their elite stature. This one is a comparatively simple designed set whose prime pattern is a droplet. It’s been consistent among the maangtika, billai, bajubandh, kamarbandh and earing. This one has rhodium plating and comes in beautiful intricate design. It uniquely stands out as a bridal set and sure to make heads turn for any bride. This is an interesting bridal collection with a combination of both gold and rhodium plating on some intricate designs. It looks beautiful and unique and fits for the wedding occasion. Jewellery Artist Quote: This dual combination of yellow and white metals has come up as the latest jewellery trend among the bridal collections. More and more South Indian brides are checking designs with such a look. For brides who want the traditional gold look, nothing can be better than this set of bridal jewellery. It offers two sets of maangtika, three traditional South Indian neckpieces and a beautiful jada billa. Everything in this set has the traditional South Indian touch in it. 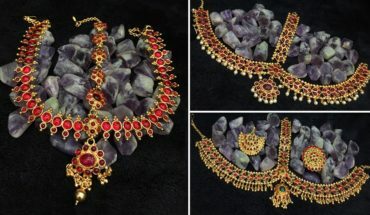 Jewellery Artist Quote: The traditional yellow metal look is by far the most sought after look by the South Indian brides. Have a look at the coy South Indian bride below. She is flaunting the traditional yellow metal look for her bridal jewellery. Whether it is the Nakshi pendant, the Kasu Haram or Kasulaperu or coin chain, or any other piece; everything is adding oodles of glamour to her. This beautiful bridal jewellery set is simple yet intricately designed for brides who love to keep it minimal. It doesn’t look too heavy unlike the usual bridal collections. Jewellery Artist Quote: Modern brides usually want to keep it minimal yet stunning. Check out this beautiful bride below wearing such complete bridal jewellery set. She is wearing the traditional mango maala, kamarbandh, bajubandh, and all other items intricately designed using multiple stones and gold plating. What all Jewellery Items are Included in a South Indian Bridal Jewellery Set? Apart from a small choker, this bride is wearing a traditional South Indian long necklace which has a Nakshi design pattern. This one is a slightly heavy look for brides who do not want to go overboard for a loud bridal look. This is a beautiful South Indian traditional kamarbandh having Nakshi or temple jewellery design pattern in it. Kamarbandh is an intrinsic part of a traditional South Indian bridal look. The overall look of this South Indian bride is quite elegant and minimal. All the neckpieces are light and simple, even the earrings are simple jhumkas; but the maangtika stands out as the statement maker. Made in temple jewellery design it’s a comparatively bigger jewellery item the bride is wearing. Bangles have a huge importance in the Indian culture. It’s like a must have accessory for any bride or married woman. For wedding, brides usually go for the red or green glass bangles, or even golden. Some even get colourful contrasting bangles, like the one wearing in the above pic. Bajubandhs are usually worn on upper arms and are metallic in nature. The bride here is wearing a traditional golden bajubandh. Certain jewellery items hold a lot of femininity in them. Nose pin is one of them. It’s like an indispensable part of South Indian bridal look. The bride here sports a small traditional golden and beaded nose pin. You may also like – You cannot ignore nose pins for your wedding after seeing these bride’s photos! Even for nose pins one gets a lot of varieties. This South Indian bride is sporting a small nose pin with a beautiful beaded chain that gets locked in the hair. Such nose pins adds oodles of femininity in any bride making them all the more beautiful. This is traditional South Indian billai worn by a South Indian bride. Each of them is put at the intermediate knots of the plait. This is a single chain jada billai, yet another traditional hair accessory worn by South Indian brides for a hard-core traditional bridal look for their wedding. The bride here is wearing a single choker of diamonds and emerald. The bridal set is giving her a minimal yet stunning look. Here’s what Veenamani had to say: As a girl I have a fetish for emeralds more than any other stones, so for my marriage ceremony I got in touch with the TBG team who arranged some stunning emerald bridal set for me. I simply loved it. With these and many more in its store TBG offers the best ever complete bridal jewellery sets for rent. In case you are a to-be bride, you should definitely contact us and tell us about your requirements.